In winter and early spring, food sources along the Inside Passage are highly localized. In March, herring spawns. In vast schools the animals enter bays to deposit their eggs on kelp and eel grass. 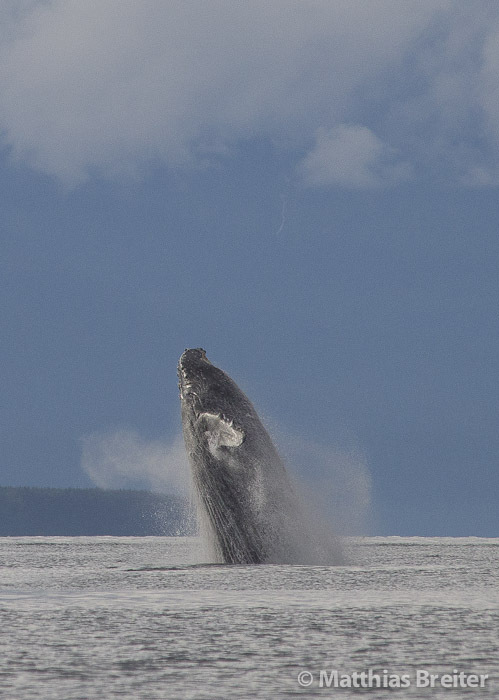 Humpback whales dive through clouds of fish, mouth agape. Above the water, gulls circle. 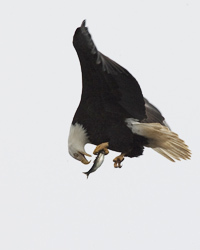 Bald eagles wait in the trees above tidal narrows where currents pack the fish tight and push them towards the surface. In close succession, eagle after eagle swoops down, points his feet forward just before making contact with the water and clamps his talons around the writhing prey. There can be as many as several thousand eagles in a large bay. 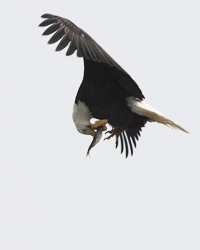 With competition high, many eagles devour their catch midair to avoid harassment by other birds and then dive down again to get seconds. 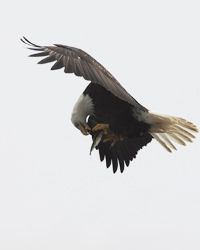 In early summer, Anan Creek is one of the best places in Alaska to view bald eagles. Hundreds perch in the tall Sitka spruce along the shoreline. At low tide, dozens sit on the mud flats in Anan Lagoon at the mouth of the creek. Generally bald eagles are spread out across the Panhandle during the warm months of the year. There are so many fish runs, so much salmon to be had, there is no reason to congregate on any specific stream. However, the Anan is an early productive run in the region and eagles flock in. By August, their lines have thinned again. Although salmon are still migrating strong up Anan Creek, there are other places where food is caught easily, and no reason remains to compete over the same resource. Taken from Matthias’s award-winning book Inside Passage. The crash of splintering wood pierces my dreams and rouses me from a sound sleep. Instantly, I am wide awake. Nothing speeds up the circulatory system like a dose of adrenaline. My fingers search for the flashlight. The beam of light cuts through the dark like a knife. 12:30 A.M. As if knowledge of the time mattered and would help me in the least. I hear a loud crashing, as if a door is being ripped from its hinges and thrown to the ground. I sit in my tent, desperately pondering my options. It is early October and I ma the only person still staying in Brooks Camp near the river. I can yell until I’m blue in the face; nobody will hear me. The pontoon bridge is broken down into segments and pulled ashore, and I don’t have a canoe. I open the tent door and glance outside. The futility of any attempt to assess the situation visually is instantly apparent. I might as well stare at a black velvet cloth. I cannot see a thing. The source of the racket appears to be but a few steps away, yet it must be a least twenty yards. That’s how far away it is to the food cache. The racket in front of my tent continues unabated. If the noise is any indication, there cannot be much left of the food cache. 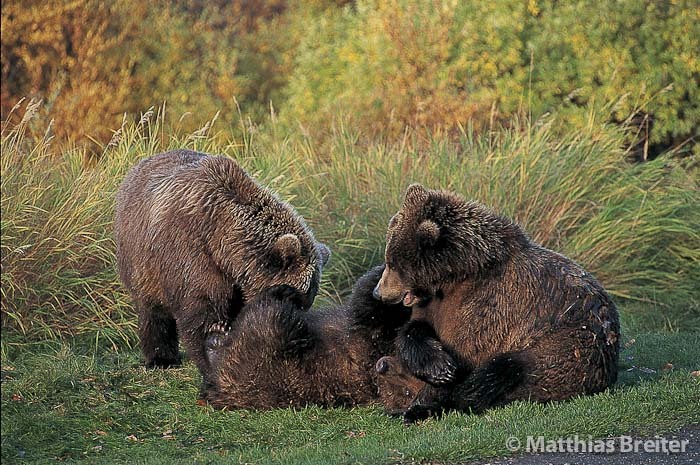 Occasionally, wildlife photography is blessed with unforgettable moments. This one certainly qualifies as such as well, although not in a positive sense. Finally, at about two o’clock in the morning, the din starts to abate. Yet, sleep is slow in coming. 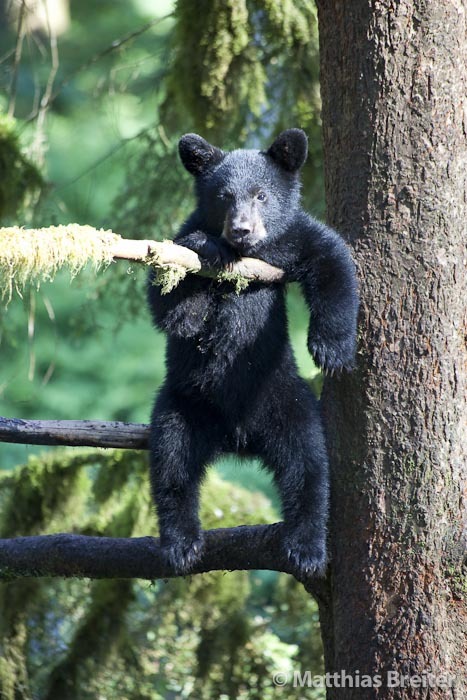 I abstain from counting sheep as they would only turn into bears, leaving me more wakeful than before. Finally, around eight o’clock in the morning I step out of the tent to inspect the destruction. To my surprise, the food cache is still standing. Even the door is in place. At eye level, two large paw prints smile at me. More cover the backside of the building. Upon rounding the cache, I find the source of last nights pandemonium. Several one-gallon canisters of white gas and a few propane bottles are strewn about on the ground. All show teeth marks. My tattered nerves need a rest – one night like the last is enough. A true tale from Matthias’s travels. 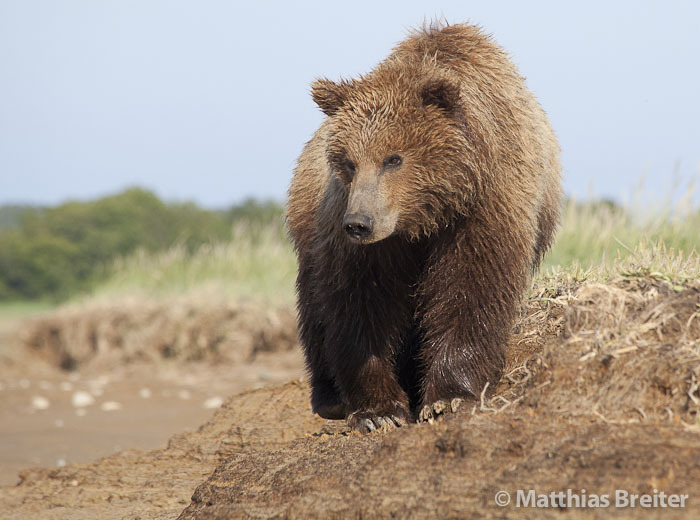 Read more in his book Bears of Katmai.